Contents: Nachos, French fries, ketchup, chocolate milk, peaches. Notes: Seriously? Nachos and French fries? This is why kids are fat. Nachos should not be the main course...as they were often served in my school. Doesn't mean I didn't love them though! There is no denying they are delicious, but I don't think they should count as a meal. not only is it the death of healthy eating, it's the death of the taste buds! fried, salty, ketchup, sugared syrupy fruit product and chocolate milk. bleck! Does that kid really need that much ketchup for those fries? It looks like five packets. 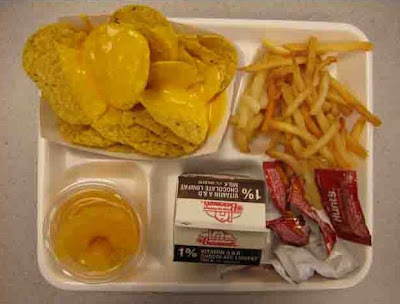 This is just disgusting - as are many of the USA lunches I'm looking at here. Why? There's so much good food out there to be had. How in the world is this acceptable to anyone? I just come across your blog and this lunch shames the US. What are we doing to our kids! Keep up the good work. let the masses know why our kids are fat! Now that school lunches have new requirements (more veggies, especially red and orange ones, more legumes, fruit, and whole grains, and lower fat milk) children are not trying the veggies or fruit. They are throwing them away. So, now kids are hungry in the afternoon. Good eating habits start at home!